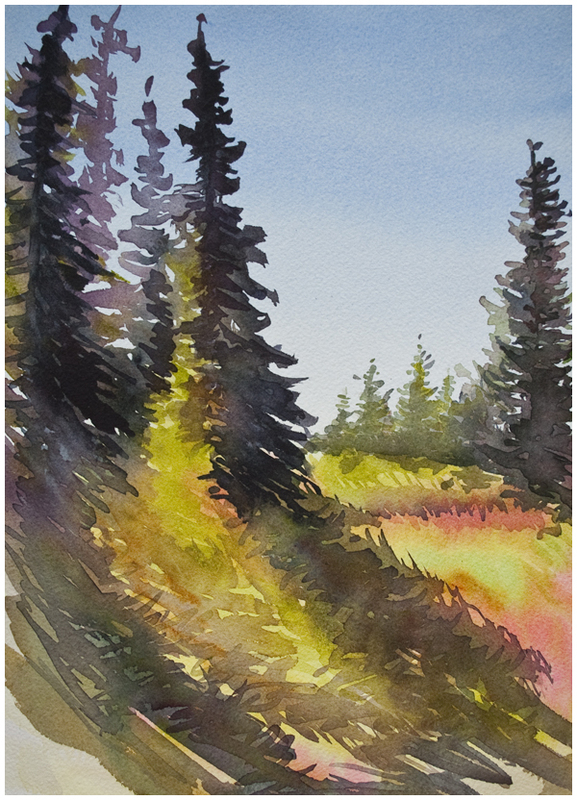 For the last two months I've been working on building my new online course, "Composing the Landscape in Watercolor". Putting a course together is a lot of work! I have to figure out what to teach, and then put together coherent video with sensible explanations. Which means I also have to actually know what I'm doing, and how to verbalize a process that is usually very internal. It was worth it though, as I believe my new course is the best one yet, full of content (over 3 hours of video) and with four complete painting demonstrations, including the two paintings shown below. I have priced the course at $99USD, however I have a bit of an earlybird discount for those who want to join right away. Until January 18th, you can get the course for $39, using this link. Please also be aware that my Florals course coupon code, providing that course for just $49, will be discontinued at the end of January, so if you have been planning on enrolling in that course, now is the time to do it! As always I am so excited by this new step, and so thankful that I get to live this wonderful watercolour adventure. Thanks for joining me on it - watercolor people are THE best kind of people!